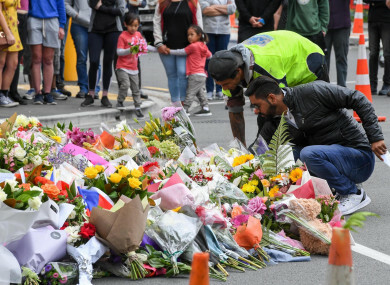 AN AFGHAN MAN who died after reportedly jumping into gunfire to save his fellow worshippers is among the first named victims of yesterday’s New Zealand gun attacks. A right-wing extremist, has been charged over the attacks on two mosques in the city of Christchurch, which left 49 people dead and dozens more injured. The attacks have prompted an outpouring of grief and deep shock in the usually peaceful country, which prides itself on welcoming refugees fleeing violence or persecution. Many offerings were accompanied by handwritten letters laden with sadness and disbelief, from residents of what one local driver called the “city of sorrow”. “It was a very bad day, not just all of us, all of New Zealand,” said Ibrahim AbdulHalim. But, he added: “We still love this country”. The attacks have been called terrorism by Prime Minister Jacinda Ardern, and are thought to be the deadliest attack directed against Muslims in the West in modern times. Speaking outside a court this morning, the son of 71-year-old Daoud Nabi, the first victim to be named, demanded justice for his late father, who believed New Zealand to be a “slice of paradise”. Nabi had lived in New Zealand for more than 40 years after fleeing Afghanistan as a refugee in the late 1970s. His son Omar learnt that his father had died after trying to shield someone else from a bullet. Another of Daoud’s sons, Yama, was on the way to the mosque when he bumped into a friend who told him “your father saved my life”, according to Australian newspaper The Age. Another victim, 14 year-old Sayyad Milne died at the Al Noor mosque which he attended with his mother and friends every Friday, the New Zealand Herald reports. His father John Milne said his son’s death hadn’t been officially confirmed, but he’d been told the teenager had been seen lying on the floor of the mosque, bleeding. Email “71 year-old who jumped into gunfire to save others is first named victim of New Zealand attacks”. Feedback on “71 year-old who jumped into gunfire to save others is first named victim of New Zealand attacks”.